The Märkisch overland trail connects the Lower Oder Valley National Park to other national natural landscapes of the Uckermark. Hiking in the Lower Oder Valley National Park is made possible by an intricate network of hiking trails, which is criss-crossed by a total of 14 hiking and adventure trails. The Märkisch overland trail is one of the national hiking trails that go through the National Park. The Märkisch overland trail connects the three national natural landscapes of the Lower Oder Valley National Park, the Biosphere Reserve of Schorfheide-Chorin and the Uckermark Lakes National Park to each other; making the impressive landscape of the Uckermark tangible, characterized by the Ice Age with its rolling hills, extensive forests, lakes, brooks and other mysterious places. It is 200 kilometres long and goes from Feldberg to Mescherin, along the National Park and through the national park region. It is subdivided into ten sections, which can be done as day hikes. Section 7, which is 14.6 kilometres long, leads from Angermünde via Crussow to Stolpe. From the ramparts around the Stolper Tower, hikers can enjoy a fascinating panoramic view over the southern Oder Valley. The hiker’s eyes can look across the floodplain landscape, which is criss-crossed by several branches of the river, all the way to the horizon. Section 8 of the Märkisch overland trail leads along the western edge of the Lower Oder Valley National Park from Stolpe to Schwedt. The landscape here is characterized by Oder backwaters, sedge reeds, reed beds and riverside woodlands and serves as a breeding ground, resting spot and wintering location for waterfowl. Each season offers its own nature experience. In September the cranes gather in the Oder Valley. In winter, singing swans can be observed, which use the Lower Oder Valley as their wintering quarters. The 23.9 kilometre tour goes through the national parks in Criewen and Zützen. It crosses, among other things, the Criewen Lenné Park, which is considered one of the most beautiful park facilities in the Uckermark. 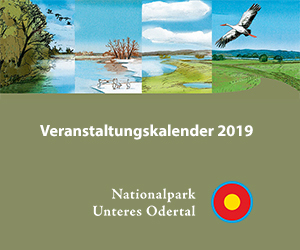 There is also the possibility to visit a permanent exhibition at the National Park House and learn about the Lower Oder Valley National Park. Section 9 goes into the northern region of the National Park. It begins in Schwedt and, after a distance of 17.3 kilometres, ends in Groß Pinnow. The cultivation of tobacco, once the economic backbone of the region, marks the townscape of many villages with large tobacco stores and barns. Today, hardly any tobacco is grown here, but its impressive architectural testimonies can still be contemplated. In Vierraden, a museum displays information about the history of tobacco cultivation in the region, which was one once one of the largest tobacco growing regions in Germany. Section 10 is a 19.1 kilometre-long arc around the National Park region that ends in Mescherin. This is the location of the northernmost gate to the Lower Oder Valley National Park. From here, visitors can cross the Mescherin Oder Bridge into the Polish part of the Lower Oder Valley. Right next to the border bridge, an eleven-metre-high observation tower provides impressive views of the Staffelder Polder, where the wilderness has been developing undisturbed for more than 20 years. For about one third of its route, the Märkisch overland trail runs along the Lower Oder Valley. It is the only certified “Qualitätsweg Wanderbares Deutschland” (Quality Trail of Hike-able Germany) in the region. It has received this certification due to, among other things, its high level of variety and great potential for adventure.